January 2013: Takes a close look at how REITs are shaping the industry, benefits they bring to the market, and how independent operators can compete against or take advantage of their marketing and spending power. February 2013: Delves into issues of self-storage revenue enhancement, addressing the generation of income, cost-cutting measures, facility discounting, new business and add-on profit centers. March 2013: Provides insight to self-storage real estate and finance, providing an overview of the 2013 lending environment, taxes, buying/selling activity, operating performance and more. April 2013: Examines self-storage operational challenges by revealing how operators would and should handle a series of tough situations involving customer service, legal issues and more. May 2013: Explores the use of technology and how facility operators can use it to improve service and productivity and generate more revenue. Topics include software, "the cloud," automation tools and more. June 2013: Takes a close look at self-storage facility design including unique building materials and accents, the use of color, creativity with challenging spaces, and redesigning older facilities. July 2013: Addresses facility safety and security including ways to keep the business safe, security-system components and upgrades, new security tools, lock quality, crime prevention and more. August 2013: Contains the annual Buyer’s Guide, a directory containing hundreds of self-storage product and service suppliers, plus domestic and international associations. September 2013: Focuses on self-storage building and development, including trends, the construction timeline and budget, building aesthetics, conversions and more. 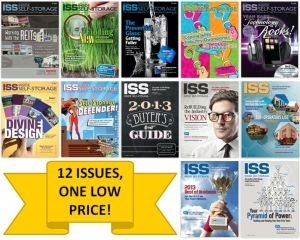 October 2013: Provides the ISS 2013 Top-Operators List as well as an in-depth analysis of list trends. This issue also includes a detailed focus on third-party services for self-storage operations. November 2013: Highlights this year’s Best of Business winners, and includes insight to the inner workings of more than 20 companies. December 2013: Explores important issues of self-storage staffing, with articles on hiring, employee retention, evaluations, training, manager bonuses and more. For more detailed descriptions of the individual issue contents, please refer to the unique product pages.